Seriously.... I don't know how the Cantonese pronunciation should be.... is it, koo loo yoke, or koo lou yoke. I even hear some calling it, gou lou yoke, as in tall guy meat. Whatever the name is... it's Lydia's favourite dish. The first dish she learnt to call by name, and order at the restaurant. I rarely cook this, because I don't quite like the frying part. The last time I cooked this was around 3 years back. But then since I intended to do some frying with some other things, I might as well go on a frying streak the whole day long. Previously I couldn't get the taste of the gravy to what I have in mind..but this time I managed to get it just the way I like it. The previously missing ingredient is rice vinegar. I like my koo lou yoke with minimal gravy, as in only the pork has a coating of it, nothing flooding or drenching. And who was the happiest person at dinner? LOL, not Lydia but my man. The big kid. 1. Cut pork belly into inch big pieces. 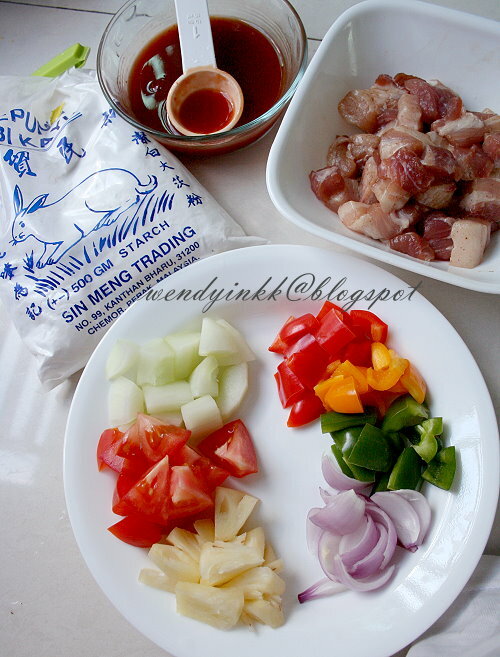 Marinade it with the rest of the ingredients for at least half and hour. 2. Meanwhile cut your vegetables and mix all the gravy ingredients together. 3. When it's time to cook, whack the egg white until very frothy. Pour this into the marinated pork belly. and mix around. Put tapioca flour into a big bowl. Coat each piece of pork with tapioca starch and place onto a plate, separated. Then with the remaining tapioca starch, Put in all the belly pieces again and toss the bowl to give the pork a second coating. 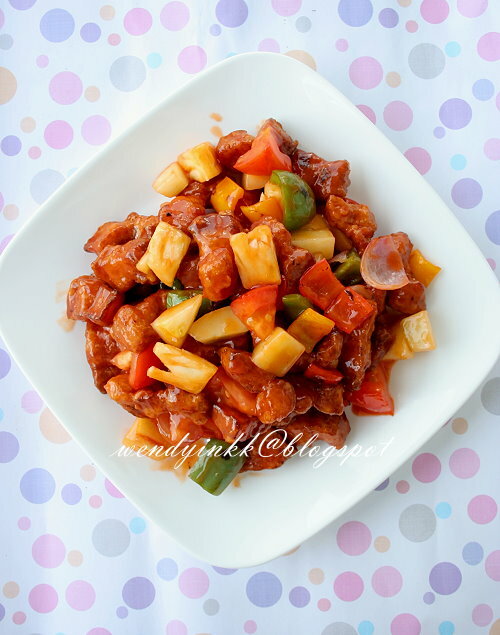 Remove the pork and shake off excess starch. 4. Heat up a wok and put in oil for deep frying. Deep fry the pork pieces until golden. Drain. 5. Heat a wok until very hot , put in 1 tbsp of oil. Then put in onion wedges and capsicum cook it until you can smell it (about 10 seconds only). Then pour in the prepared gravy mix and bring it to a boil. Put in the rest of the vegetables, give it a toss and pour in the fried belly. Turn off the heat. Give it a few tosses just to coat and dish up. Of course big kid would be happy, my hubster oso has boookmarked this dish for me to prepare. Like u i oso very sien the frying part. Thanks for sharing...try to do this coming weekend!! I am gonna try this! Thanks for sharing. My kids love this dish. 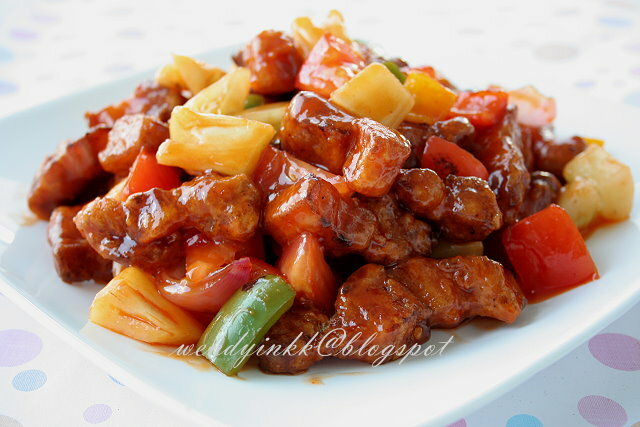 oh...yummy yummy sweet and sour pork! I cooked this recipe last Saturday. As I don't eat pork, I substituted pork with chicken breast. And it turned out good as well. Thanks Wendy for sharing all your lovely recipes and photos. 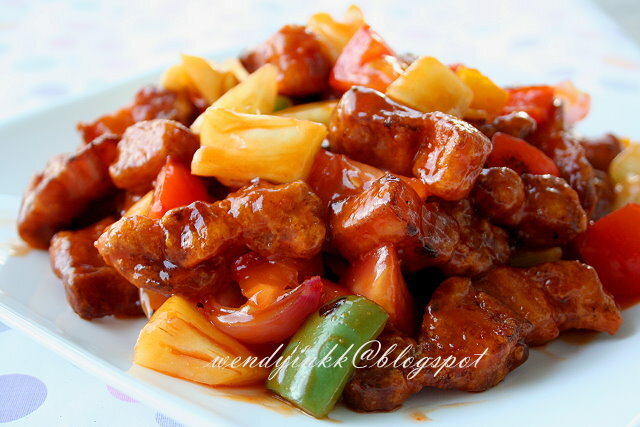 Sweet and Sour Pork is our family favourite dish. Looks delicious. Thanks for the recipe. Take care. 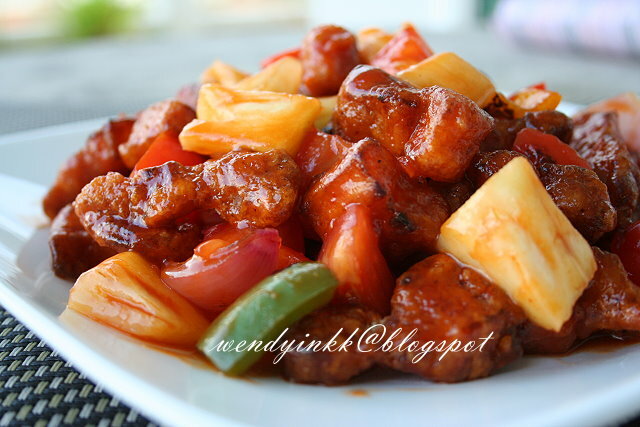 Hi Wendy, I read your recipe, you mentioned 1 cup of tapioca starch or more, is it too much? can I substitute with cornstarch ? Thanks. You won't use up all the starch. You need a good amount to dust the pork. The texture of cornstarch as a coating is not as crispy, but you can use that. I used your recipe, but substituted the pork with chicken. Turns out very well! My french-in-laws love them too. Thank you for your feedback and link up. It's a more complicated recipe than some others, but I guess it's worth it.